A romantic trip to Venice is the goal of many lovers and honeymooners from around the world. This dream city is filled with a special fantastic atmosphere, which can feel only a heart in love. That is why Venice is so attractive for those who decided to celebrate weddings in Italy. The Venice port city is located in the north of Italy. Its unique location, situated on 118 small islands inspires to be strong and resistant to the advancing sea elements. According to the data made by the satellite of the Earth, this wonderful city sinks underwater, every year with 4 mm. In spite of this fact, Venice continues to struggle for its existence and delight guests with the beauty and splendor of its decoration. The city’s islands are connected by 150 major and a few of the small bridges, which run through the water channels. 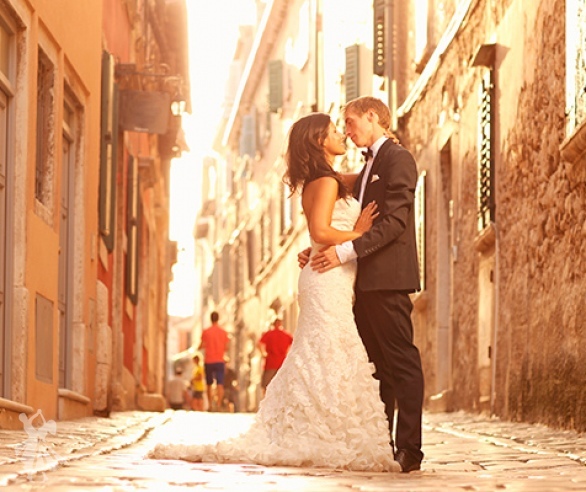 Spring and autumn are the best times to travel and celebrate weddings in Venice. At this time, there are few tourists in the city and a solar warm weather is setting down. Starting in November to March the rains get started, and other frequent phenomenon like fog, cold wind, dampness and humidity, as well as flooding occur. A really cold weather can only be met in January. An almost complete absence of tourists and also local people can be observed on the streets during this period. Summer weather in Venice is hot, where the temperature can reach 30 degrees. Near the museums and galleries long queues of tourists can be seen all over. It is also worth to consider the Venetian Carnival that takes place in this period, which is a big, noisy, and cheerful event. The holiday lasts more than one day, and it’s unlikely to have peace and quiet at this time. Likewise, you can combine your celebration with a fairy carnival parade. 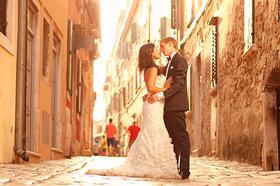 Whatever time of the year you will choose for celebrating your wedding, Italian Wedding agency, will take care to satisfy your dream of getting married in Italy. The most convenient way is to take advantage of direct regular or charter flights from anywhere in the world to Venice. The "Marco Polo" airport is the host of many airlines from all over the world. The other "Treviso" airport hosts budget airlines planes from Europe. At your disposal and wish, a representative of the Italian Wedding agency will meet and get you on a comfortable car to the place of your residence in Venice. For more information about how to get to Venice, please contact the Italian Wedding agency. Doge's Palace (Italian: Palazzo Ducale) which construction has begun in the IX century, but the today’s existing view, the building has acquired in the XIII century. It is characterized by a harmonious mix of styles such as Renaissance, Moorish and Gothic. Cathedral of San Marco is a very beautiful building, showing the elegant work of genius masters, made in Byzantine style, in 1063. St Mark's Campanile is the main bell tower in Venice, which has a height of 92 m. At the top of the bell tower is a statue of the Archangel Gabriel. The bell tower was built in the IX century, and in 1902 it gently struck. A little later, the monument was safely restored to its original form. The Santa Sofia Palace is a magnificent palace built in the gothic style. Saint Mary of Health (Italian: Church of Santa Maria della Salute) is the largest domed church in Venice. Bridges and canals of Venice are the original attractions of the city, a popular place for romantic dates, as well as for photo and video sessions. The most outstanding of them are the Grand Canal, the Bridge of Sighs and the Rialto Bridge. Organization of wedding ceremonies and romantic dinners in Venice, has long ago reached the highest level. In addition to this, the seafood dishes, European cuisine, and delicious wines, add even more excitement and joy to your celebrations. Enjoy this unique possibility and spend wonderful moments of your main holiday in Venice.